did you know an estimated 95% of your digestive system is controlled out of your upper neck via the vagus nerve? About 95% of Your Digestive System Is Controlled Out of ​The Lower Brain Stem Located In The Upper Part of The Neck. For most people, digestion is a natural process that we take for granted. However, there are millions of Americans who are not as fortunate. When the digestive process goes awry, it can result in any number of digestive disorders, all of which can interfere with every aspect of their lives. While the list of digestive disorders is vast and varied, some of the more common disorders include colic, acid reflux, constipation, irritable bowel syndrome and Crohn’s disease. A common component of many of these can be described as a nervous system that is “out of sync.” Every section of the GI tract is prone to its own unique disorder - some are merely annoying, such as heartburn, while others can be painful or even debilitating with cramping, bloating, diarrhea, constipation, or bleeding. If the condition persists, it can undermine a person's overall health, and, in some cases, threaten their lives. Medical Treatments that many sufferers attempt to use to treat their symptoms with are over-the-counter (OTC) drugs. If this fails, they are typically given prescription drugs or steroids. As a last resort, surgery may be recommended to repair or remove a section of the digestive tract. However, the Physician’s Desk Reference reveals that the drugs used to treat digestive disorders can have potentially dangerous side effects. Some may cause further digestive distress. Research and clinical evidence continues to suggest that a malfunctioning nervous system may be a key factor in the development of many digestive disorders. 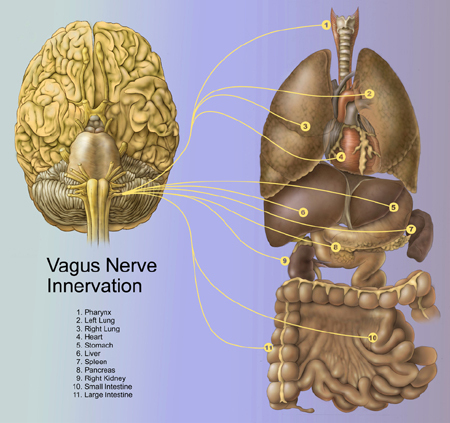 Much of the control of the digestive system is under the direct control of the brain stem via the vagus nerve. The brain stem is the command center for many vital functions, including digestion. It works very much like a telephone cable with thousands of individual wires or nerve fibers, sending signals back and forth between the brain and brain stem to every cell, organ and system within your body. Misalignments in the upper cervical spine (neck) can interfere with the function of the brain stem, which can be a critical factor in many health problems, including digestive disorders. These misalignments may be caused by a number of things, including bumps, falls, sports injuries, car accidents, birth trauma and emotional stress. Health problems may appear immediately after the injury or several years later. Dr. Grayson Blom is a Boise, Idaho native that works with a nationwide group of Doctors expertly trained and specializing in the Upper Cervical procedure. Dr. Blom is also one of the few Doctors in the state of Idaho trained and certified in the Upper Cervical procedure. We are dedicated to helping patients just like you who suffer from digestive disorders, chronic headaches, migraines, neck pain, back pain and other spinal-related disorders.